What are your plans for Valentine's Day ? Dining out ? Staying in ? As for us.. we haven't decided yet. We may or may not go out for dinner. 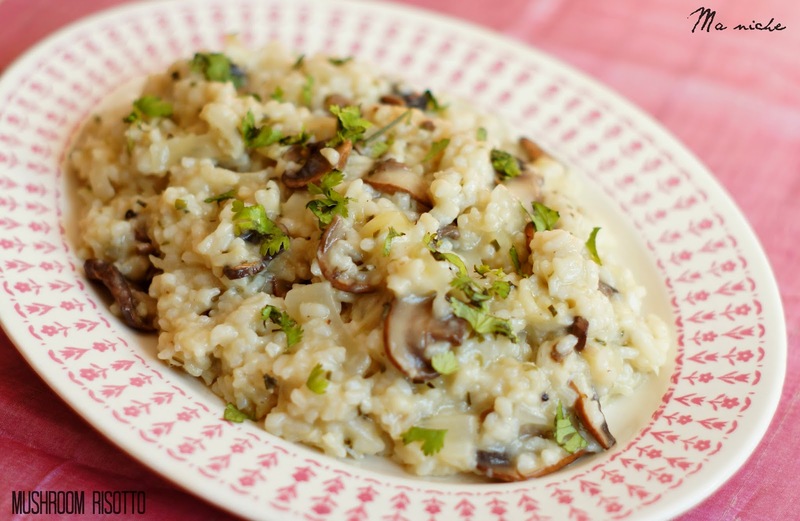 But if we stay at home, then I'll probably make some Dressy Pasta Risotto and Chicken Piccata or this awesome Mushroom Risotto followed by a decadent chocolate cake. In a medium sized saucepan, bring 3 cups of water to boil. Add the rice and cook for 10 minutes. Switching off the heat, drain the rice and keep aside. Bring the chicken broth or water-bouillon cube solution to a boil and keep aside. Heat the oil in a heavy bottomed vessel. Add the onions and saute till they are glossy but not browned. Add the semi-coked rice and stir to coat it with the onions and oil. Stir in the white wine and allow it to sit for a couple of minutes until most of it evaporates. Keep a close watch, the rice should not stick to the bottom of the vessel. Add 1 cup of the chicken broth, stir well and wait until most of it has evaporated. Repeat the process until you reach the last cup of broth. Once you have added the last cup of broth, stir well and add the mushrooms followed by the butter, grated Parmesan, chives and pepper. Stir gently to mix the ingredients. Cooking over medium heat, allow the butter and cheese to melt and the broth to evaporate. Taste and season with salt if required. Stir well and cook until no liquid is left and the rice looks creamy. Switching off the heat, allow the rice to sit for 5 minutes. Then serve into bowls with a sprinkle of parsley or coriander and some grated cheese. 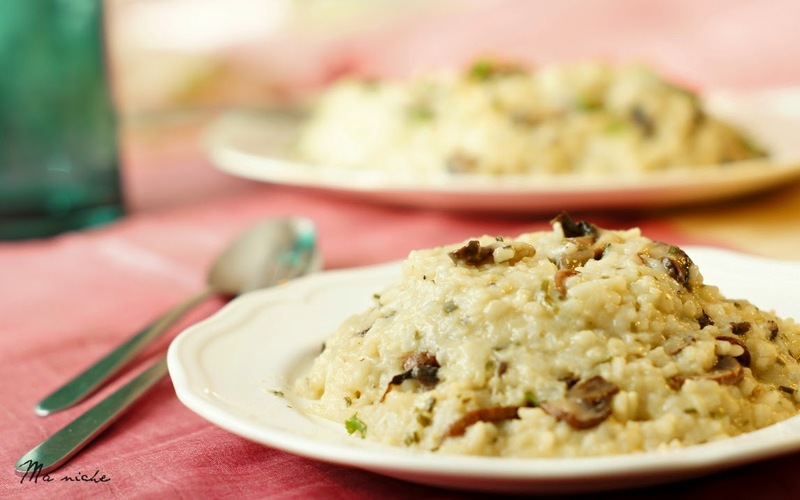 Very healthy risotto, looks perfect. Your herb choice makes this recipe really unique. I can't wait to try it. delicious risotta :) very healthy one !! 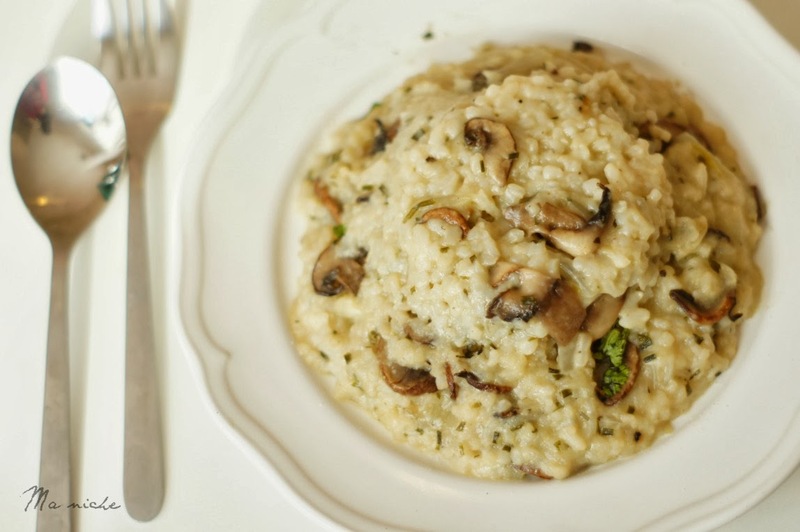 Your Mushroom Risotto looks so creamy and delicious. Thanks so much for sharing with Foods of The World and hope to see you next month in Ireland! Risotto looks so good . Should try your version really soon. Thank you for sharing and travelling with us to Italy . We are going to Ireland next month on 11th . Do link your Irish dishes next month .